You see an interesting girl at the bar. Before you approach her, you take a quick snapshot of her with your phone, and -- within seconds -- get automatically connected to her Facebook page to find out her favorite song, or to see if she's even single. It may sound like something out of a movie, but this sort of online-offline integration is now a reality. A company from the Netherlands has come up with a way to let you wear functioning social Web links on your clothes, and you can take their idea and do it for free. Sound crazy? Keep reading. The company, called W-41, has created a line of shirts with specially created barcodes that can be "scanned" by cell phones. The barcodes correlate with any URL you want -- your Facebook page, your blog, whatever. Anyone else can take a photo of the barcode with their Internet-enabled cell phone and then automatically be directed to your URL within their phone's browser. It's just like a regular Web link, only transported to the real world. The barcodes are powered by something called ShotCode -- a mobile tagging technology that has been around for several years. ShotCode follows the model of other 2D barcode systems such as Neom and Scanbuy, and, like its competitors, has thus far been used largely limited to commercial endeavors. The shirts are among the first personal and social applications for the technology. Past usages include marketing campaigns by companies such as SonyEricsson Finland and Nike Brazil. The corporations have printed the symbols on billboards, bottles, or even television ads and then asked customers to scan them to interact. When it comes to the new social use, there is a catch: People have to have a special application installed on their phones to be able to read the barcodes. ShotCode says its free app supports more than 360 different phone models -- including, of course, the iPhone -- but still, someone would have to take the initiative to install it for the thing to work. This requirement is no doubt the limiting factor of the technology. Until the idea gains widespread interest, you'll just look like a guy with a strange symbol on his shirt to the average observer. There are also clear privacy concerns -- you might not want to walk around the city with your social network profile virtually stamped on your back for anyone to scan. Because of that, I suspect the social network shirts won't become an everyday, walking around the streets sort of commodity. Still, the concept holds interesting implications for specific and limited scenarios. Imagine, for example, singles gatherings where everyone has a linked up shirt, or specific nightclubs that encourage the use of the technology on particular evenings. Even a private party where everyone invited gets a linked-up shirt could make for a unique sort of social experience. The barcodes could also prove useful for conferences or other work-related gatherings with social components. Instead of trying to remember everyone's name and stats, you could just scan the back of someone's shirt before walking up and take a quick glance at his or her LinkedIn profile. W-41 charges $49 for its regular barcode-enabled shirts. If you don't want to shell out the cash, though, you can take its idea and make your own interactive fashion item. 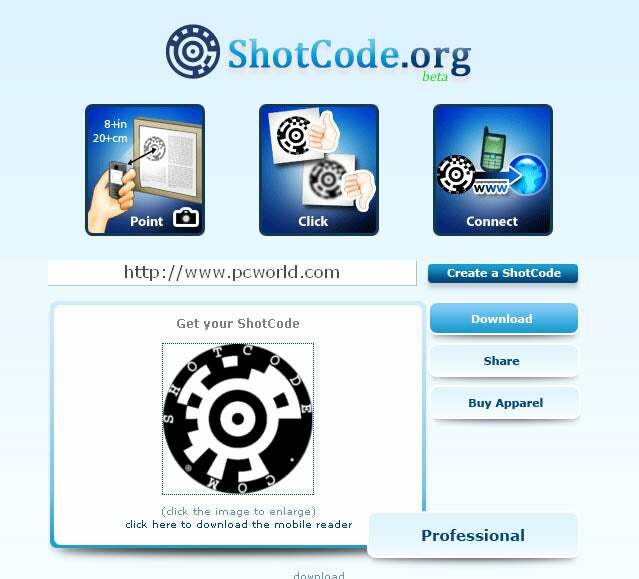 A site called ShotCode.org offers a simple self-generation tool for the ShotCode barcodes. You just type in the URL you want embedded and click a button, and you get a fully functioning barcode to do with as you please. From there, just use any of the Internet's many shirt-printing services -- or, heck, go buy an iron-on shirt kit for $5 -- and you can stamp the code on as many shirts as you want. scanning failures such as the CueCat, this new take on the technology isn't built to let corporations target you with their ads -- it's built to let you target other people socially. Like, you know, that cute woman at the bar. Or the curious crowds who show up to your first annual "Social Network Scanning Party."